movie summary: Charlie (Logan Lerman) is about to enter high school with no friends. His best friend recently committed suicide leaving Charlie all alone to face the next four years on his own. Within a few days Charlie will meet Sam (Emma Watson) and Patrick (Ezra Miller) that will bring him into their social circle and change his life forever. On Charlie’s first day he makes friends with his english teacher Mr. Anderson (Paul Rudd) who gives him a list of books to read over the semester. Since he doesn’t have much of a social life he plows through the list and by January has finished it. He meets Patrick for the first time in shop class. It’s Patrick’s senior year and he still hasn’t passed freshman shop where he has turned into the class clown. One night at the football game Charlie awkwardly approaches Patrick to say hi, Patrick offers a seat next to him and they enjoy the football game until Sam shows up. Charlie falls instantly in love with the very beautiful Sam who has a very bad repetition for sleeping around as a freshman. The three of them become friends before going to the local diner after the game for a meal and laughs. The trio attend parties together where Sam and Patrick continue to learn more about Charlie and how depressing his life has been over the last year. When they find out his best friend died they officially welcome him into the Wallflower club. Charlie is speechless because he has never been accepted like this by anybody. Another girl in the group, Mary Elizabeth (Mae Whitman), decides she wants to date Charlie, the two hit it off very awkwardly due to Charlie’s crush on Sam. Mary Elizabeth controls every aspect of his life which causes him to wish he was with Sam even more. During Christmas time the group plays a game of true or dare which causes Charlie to kiss Sam and ruin his relationship with Mary Elizabeth and along with his friendship with everyone else. Patrick has been secretly dating the school’s starting quarterback Brad (Johnny Simmons) only to see his relationship end when Brad’s father finds out. The football guys begin to make fun of Patrick and beat him up one day at lunch. Charlie who has not been around Patrick or Sam for weeks, has sat alone in the corner of the lunch room all by himself, comes to the aid of Patrick. He storms over and busts a few heads and noses to save Patrick. Sam appreciates what Charlie has done so the past is forgotten and everyone welcomes him back into the group. Sam has been dating a college guy for months even thought he is secretly sleeping with someone back at his school. Charlie hates the fact that Sam will date a guy like that when she deserves so much better. During the Sam’s secret santa exchange they share a real kiss for the first time which brings back some horrible childhood memories for Charlie. Over the next weeks Charlie spends time hanging out with Patrick to help ease his break up with Brad and with Sam preparing her for the SAT test and college. When the school year ends Charlie watches as the gang graduates and he is left all alone. Sam learns that her boyfriend is a cheater and breaks up with him but doesn’t run to Charlie because she leaves for school in just a couple of weeks. Patrick meanwhile decides to apply to school on the west coast to get away from their hometown. Charlie hangs out with his two best friends every day before they leave only to be left alone when they drive away. Charlie has struggled over the last year with some personal problems, things he has kept locked in his heart and mind. He lost his aunt on his birthday as a little kid and lost his best friend just a year early. He is so sad inside and can’t keep everything bottled up anymore. After Sam and Patrick drive away he returns home and attempts to take his life. 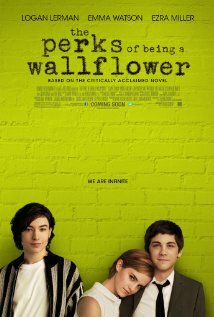 my thoughts: The Perks of Being a Wallflower is an absolutely fantastic movie that isn’t your typical teenage high school movie. The story, characters, and sub-story are deeply rooted in emotional turmoil. The movie focuses on the highs and lows of life as a teenager and those who have seen their fair share of bad things growing up. This is a heart warming story of overcoming personal demons and being accepted for who you are no matter what your past is. The three main characters of the story, Charlie, Sam, and Patrick could not have been more perfectly cast. Lerman is great as the shy and quiet Charlie who just wants to find a place to belong, besides at home where he doesn’t have a great support network. Miller is spot on as the comedian of the group, he is the glue that keeps everyone together while being the down to earth funny man who can brighten anyone’s day off. Watson comes into the picture as the most beautiful girl in her school who isn’t the most popular. Poor decisions from years ago have prevented her from being that kind of person. She is the happy-go-lucky type who continues to make bad decisions despite the fact everyone around her loves her more than themselves and would do anything to support her. The main point of the story is about the effects of depression and suffering inside. Charlie has managed to suppress so many things in life while carrying a whole luggage bag of emotions with him. He goes through several moments of trouble when he black outs, loses his memory, and freaks out. Those are examples of someone dealing with a lot of problems and even though he has built up a great social circle, his problems are deeper then what his friends can do for him. It is charming in many aspects to know that he tries his best to fit in and be accepted for who he is. This movie came to life from the book by Stephan Chbosky who directed this screen adaptation. You would be hard pressed to find someone say anything wrong about this movie so do yourself a favor and read the book and/or watch the movie. Made me cry like a little baby when I saw it. Then again, I saw it a couple of months after I graduated from high school, so it all made sense. Good review Ryan. You are so young Dan! I’ve been out of school for more then a decade but this was still a touching story even for old people like me ha ha. Thanks for commenting!! Fantastic review! I must say that I did enjoy this movie, it was very good! Thanks again Zoe! I haven’t met anyone who had anything bad to say about this movie…yet ha ha.